Former top fire fighter Greg Mullins says Federal Government inaction on emissions reduction is worsening the bushfire threat and putting people and homes at greater risk. He says that a climate change bushfires increase link is undeniable. Mullins was a fire-fighter for around 50 years. A former NSW Fire and Rescue Commissioner, he received an Australian Fire Services Medal for his work. Speaking to the Sydney Morning Herald, Mullins says Australia is getting longer and more severe fire seasons than before. He also says bushfires are becoming increasingly difficult to put out. 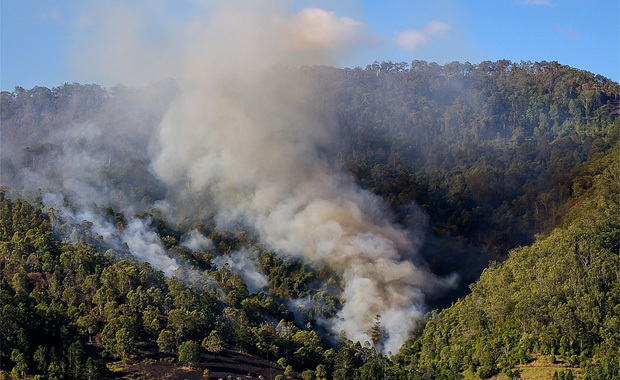 Mullins’ comments were made around the same time as the Prime Minister Scott Morrison and Opposition Leader Bill Shorten visited Tasmania which is experiencing catastrophic bushfires. Mullins also mentioned how the PM’s failure to mention climate change in his Tasmanian address “astounded” him. While Mullins unleashed on the current government, saying it has a “policy-free zone” on climate change, he also claims both major parties are at fault. For example, in 2006 he tried to raise the alert about the climate change bushfires link after severe fires in the Blue Mountains. He says the NSW Labor Government censured him at the time for doing so. He also says he doesn’t think “either of them” [Labor and Liberals] “really have answers or are doing enough” to tackle carbon emissions. Both federal Labor and the Coalition claim to be doing their bit on climate action. The Federal Government’s policy is to reduce carbon emissions by 26 per cent of 2005 levels by 2030. However, both the OECD and Australia’s Energy Security Board say this will be very unlikely under current policy settings. Meanwhile, Labor has pledged a 45 per cent emissions reduction by 2030 if elected to government this year. Labor’s commitments also include 50 per cent renewables such as wind and solar power projects by 2030. While politicians continue to argue and to stall on climate change, many Australians are not waiting for new federal policies but are instead taking action. For example, some states, territories and even local governments have been setting their own emissions targets. This includes Victoria (30 per cent reduction by 2020 and zero net emissions by 2050) and ACT (zero emissions by at least 2045). Many residents and businesses are also acting. For example, record numbers of households – over 2 million – now have solar installations in place. This means they not only help to lower carbon emissions, they pay less on their electricity bills too.